"Traditional savory dish, great with roast pork or pork chops. 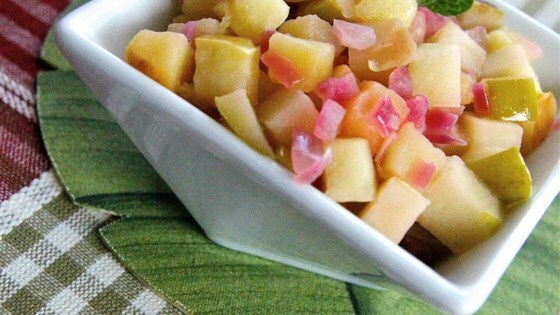 Chilled with some added bacon bits, it makes a great summer BBQ salad." Heat the butter in a skillet over medium heat until the foam subsides. Cook and stir the onion until translucent, about 5 minutes. Add the apples, and cook and stir until the onion and apples are starting to brown and the apples are soft, about 10 more minutes. Sprinkle on salt to taste. This sweet treat is great for breakfast, dessert, or even as a side with meats. Peeling the apples is optional. I prefer them unpeeled. This is a great recipe! my family makes this dish in the fall every year. My mom-mom cooks bacon with the apples though and she adds a touch of brown sugar. Everyone loves it!!! This was bitter and smelled bad when I made it as directed. Maybe I shouldn't have use granny smith apples. Loved this! My husband is allergic to red onions so I used a Vidalia onion instead. So yummy! I made this to go with pork tenderloin today and we loved the combination as a nice change of pace from my sickeningly sweet style fried apples. I'll make this again. Thought this was delicious. It had a very unique flavor, Yummy yummy! Yes. Already reviewed. Where did my review go?